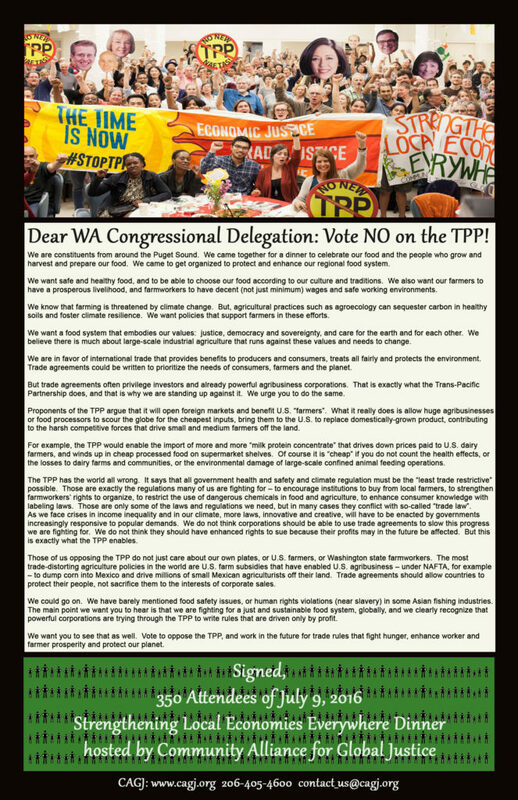 CAGJ’s Letter & Poster to WA Reps: VOTE NO on TPP! CAGJ is delivering this poster with the below letter to our WA Congressional delegation this week. We salute Congress-members Adam Smith and Denny Heck, who have both announced their opposition! The poster represents the 350 people who attended CAGJ’s July SLEE Dinner, and took this collective photo to sent to our Reps! DEAR WA CONGRESSIONAL DELEGATION: Vote NO on the TPP! We are constituents from around the Puget Sound. We came together for a dinner to celebrate our food and the people who grow and harvest and prepare our food. We came to get organized to protect and enhance our regional food system. We want safe and healthy food, and to be able to choose our food according to our culture and traditions. We also want our farmers to have a prosperous livelihood, and farmworkers to have decent (not just minimum) wages and safe working environments. We know that farming is threatened by climate change. But, agricultural practices such as agroecology can sequester carbon in healthy soils and foster climate resilience. We want policies that support farmers in these efforts. We want a food system that embodies our values: justice, democracy and sovereignty, and care for the earth and for each other. We believe there is much about large-scale industrial agriculture that runs against these values and needs to change. We are in favor of international trade that provides benefits to producers and consumers, treats all fairly and protects the environment. Trade agreements could be written to prioritize the needs of consumers, farmers and the planet. But trade agreements often privilege investors and already powerful agribusiness corporations. That is exactly what the Trans-Pacific Partnership does, and that is why we are standing up against it. We urge you to do the same. Proponents of the TPP argue that it will open foreign markets and benefit U.S. “farmers”. What it really does is allow huge agribusinesses or food processors to scour the globe for the cheapest inputs, bring them to the U.S. to replace domestically-grown product, contributing to the harsh competitive forces that drive small and medium farmers off the land. For example, the TPP would enable the import of more and more “milk protein concentrate” that drives down prices paid to U.S. dairy farmers, and winds up in cheap processed food on supermarket shelves. Of course it is “cheap” if you do not count the health effects, or the losses to dairy farms and communities, or the environmental damage of large-scale confined animal feeding operations. The TPP has the world all wrong. It says that all government health and safety and climate regulation must be the “least trade restrictive” possible. Those are exactly the regulations many of us are fighting for – to encourage institutions to buy from local farmers, to strengthen farmworkers’ rights to organize, to restrict the use of dangerous chemicals in food and agriculture, to enhance consumer knowledge with labeling laws. Those are only some of the laws and regulations we need, but in many cases they conflict with so-called “trade law”. As we face crises in income inequality and in our climate, more laws, innovative and creative, will have to be enacted by governments increasingly responsive to popular demands. We do not think corporations should be able to use trade agreements to slow this progress we are fighting for. We do not think they should have enhanced rights to sue because their profits may in the future be affected. But this is exactly what the TPP enables. Those of us opposing the TPP do not just care about our own plates, or U.S. farmers, or Washington state farmworkers. The most trade-distorting agriculture policies in the world are U.S. farm subsidies that have enabled U.S. agribusiness – under NAFTA, for example – to dump corn into Mexico and drive millions of small Mexican agriculturists off their land. Trade agreements should allow countries to protect their people, not sacrifice them to the interests of corporate sales. We could go on. We have barely mentioned food safety issues, or human rights violations (near slavery) in some Asian fishing industries. The main point we want you to hear is that we are fighting for a just and sustainable food system, globally, and we clearly recognize that powerful corporations are trying through the TPP to write rules that are driven only by profit. We want you to see that as well. Vote to oppose the TPP, and work in the future for trade rules that fight hunger, enhance worker and farmer prosperity and protect our planet. Posted in Food Justice Blog Posts, News, Slider, Trade Justice Blog Posts.